How would you like to be trained by the likes of Randy Couture, Pat Miletich or Bas Rutten? Well, EA Sports MMA is going to give fans the opportunity to do so when they play in the game’s Career Mode. On top of learning from some of the world’s most well-known trainers, gamers can compete internationally under each country’s specific rules and venues (i.e. Dream’s ring). Just like in UFC Undisputed, you can train your athlete in various pre-fight sessions to help bolster his arsenal before stepping into the ring or cage. As you build your character’s specific attributes, you’ll see a jump in their fighting abilities which should translate to W’s. Another feature which has fans buzzing is the “EA Sports Live Broadcast” online feature. This function allows button-mashers to create their your own fighter and post hype videos to their EA Sports account before slugging it out in front of a live viewing audience. If you haven’t been keeping up, EA Sports MMA boasts a solid roster that’s highlighted by a strong Strikeforce presence. 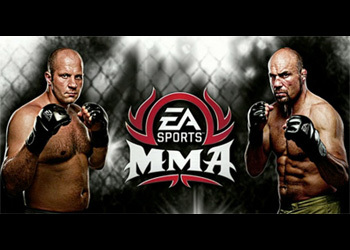 Fedor Emelianenko and UFC Hall of Famer Randy Couture appear on the game’s cover. The highly anticipated rival to THQ’s UFC Undisputed series is set to release on October 19th on the PlayStation 3 and XBox 360 consoles. You can check out some screenshots of the career mode by visiting Kotaku.com.